Next morning we flew to Pakse to start our Southern Laos journey and met our new local guide, Det. After lunch at local restaurant we drove to the pier and transferred by a simple platform catamaran to the new and lovely La Folie resort on the island of Don Daeng. The boat was built by a placing a large wooden platform across 2 wooden boats. They put 2 bamboo armchairs on the platform for the guests. This is the local way of transport and it was fun. 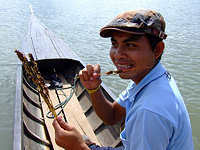 On top of that Det started to eat several sticks of roasted crickets that he had bought at the pier for his lunch. He enjoyed it but both Rob and I declined the offer to try it ourselves. He ate all the crickets, delicious he said. Our boat arrived on the sandy shore. As the rainy season had not really begun, the water does not reach the resort pier yet, so we got onto the waiting tractor/trailer for the bumpy 5-10 minute ride up to the resort. The last few steps had to be by foot but the driver/boatman carried our luggage for us. 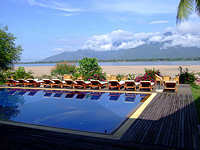 La Folie is a lovely resort built right on the shore of the Mekong River. Although it is not advisable to swim in the river the resort offers a beautiful swimming pool with views of the Mekong River in front. 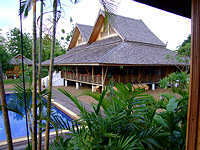 All rooms are built in local bungalow style among the lovely gardens. 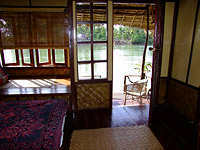 Each bungalow has a seating patio outside to enjoy the evening sunset over the Mekong River. This is a good place to relax and chill out for a few days. Activities on the island can include cycling and walking among local villages. There is a local school and temple not far from the resort. The office of the village chief near the temple is a wooden hut. This is an undeveloped island with all its local charm intact. The evening meal at the resort was a set menu of local dishes. The resort assistant manager, Mr. Alom, told me that the menu is changed daily every day of the week. We enjoyed our Laos beer with our meal, lingering over it into the night. Sadly next morning we had to move to another island to continue our trip in the South. We walked down to the shore and got on the same hotel platform boat back to the mainland. Our driver was waiting for us to drive onto the village of Ban Hat Xai Khoun for the ferry crossing to Don Khong Island. We came here to re-inspect Villa Muong Khong that we have been using for our clients for the last few years. I am pleased to see that the hotel has been renovated to a better standard of rooms in a new wing. We are continuing to use this hotel for our tours. After lunch at one of the nearby restaurants we drove back to the ferry crossing to the mainland and headed down to a pier for the boat that took us to Khone Island. 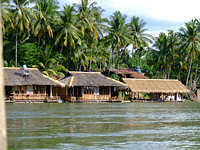 The hour-long boat journey on the Mekong River to Khone Island is very pleasant and relaxing. We arrived at Sala Phae Floating guest house to stay for one night. We have also been using this floating guesthouse for our clients for many years and I am pleased to see it is still charming with the lovely view of the river. One of our clients has described it as their best experience, sitting on the private platform at their floating room watching the sunset. I did not have such luck as rain poured down heavily by late afternoon as we walked around the village. We sheltered in one of the riverside restaurants and watched the downpour. May is the beginning of the rainy season but the rain arrived early according to the locals, coming even before the festival they are holding each year to pray for rain. That night we had another delicious catfish dish at the floating guesthouse restaurant. This time the fish steak was cooked in open oven (local traditional stove) baked in salt with the fish covered in herds and spices. The finished dish was served with potatoes and a chilli dip sauce. It is a local style of fish and chips. All catfish is freshly caught from the Mekong River. We were eating our Mekong fish looking over the Mekong River from our table. The river was asleep in the dark. The surrounding areas on both sides of the river had only the minimum of lighting due to no electricity on the island. The 3 to 4 hours electricity available from six to ten at night is by the generator of the guesthouse. Light also attracts insects in that time of the year. We asked our waiter to turn on his torch to look at the menu but within seconds the menu was covered by hundreds of insects. But a gentle breeze came up suddenly and all of the insects disappeared , allowing us to enjoy the evening eating Mekong fish by the Mekong River.